Polish away dull, rough skin. Reveal a fresh glowing complexion. Asian women have had beautiful skin for centuries. 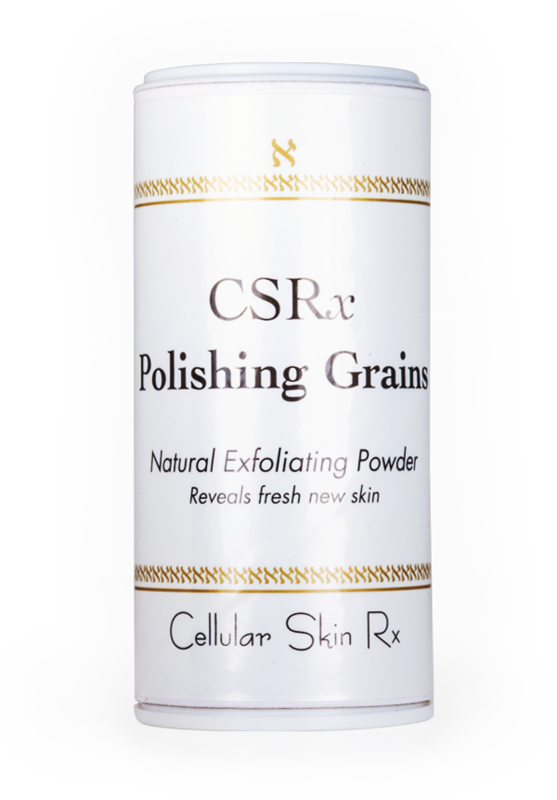 We’ve borrowed one of their time-honored secrets in creating our 100% organic CSRx Polishing Grains. Made from finely ground adzuki beans, these gentle grains can be mixed with your favorite cleanser or moisturizer to make your own completely natural custom exfoliant. Just shake a teaspoonful out into your hand, add your favorite cleanser or moisturizer, and instantly you have your own custom-made gentle exfoliant. Use these versatile Polishing Grains every day to remove dull, old skin and reveal a fresher, more polished complexion. And they aren’t just for your face. They can be used all over your body, too. If you prefer an alpha-hydroxy acid exfoliant, consider Age-Limit Advanced Refinishing serum. For an enzyme-based exfoliant, try Ultra-Gentle Surface Peel. Using CSRx Polishing Grains before any treatment serum will greatly increase penetration of the serum into the skin. To create your personal custom exfoliant, shake a small amount into the palm of your hand. Add the same amount of your favorite moisturizer or cleanser. Mix and gently apply to face or body. Use gentle circular motions to polish the skin. Rinse well. Can be mixed with facial clays or oils to give your skin a special polishing treat. Use before any treatment serums to increase penetration into the skin. Papaya, pineapple, and apple cider vinegar all contain enzymes to remove dead surface skin. For a fresher complexion, add any of these natural ingredients to your CSRx Polishing Grains…To moisturize with natural ingredients, honey may be added to the grains to create a natural moisturizing scrub. The CSRx Polishing Grains are terrific! I mix them with the Facial Cleansing Oil to make the perfect cleansing scrub now. Just a quick splash with some warm water and it’s all gone. My skin ends up being soft and smooth and bright. It’s such a nice gentle exfoliator -not like those beads that feel like they hurt your skin. I never write about products because I don’t use too many of them. I started using Accutane for acne and my skin was so flaky and awful. My mom had these grains and I started using them to get rid of all the flaky skin. They worked really well. I’m so happy my mom had these for me. Love this product! I use it everywhere – my face, my elbows, arms, legs, feet – It’s just fantastic!